Delmonico Steakhouse is a throwback to the time when lunches were an event that lasted hours under a thin veil of cigar smoke. Society has done away with the smoke here, but the classic steaks have stayed the same. 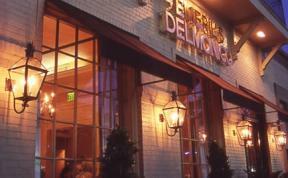 The menu features steakhouse style food, but with creole influences, and it is modeled after a century-old restaurant. If society's changes have evaded you, there is still a cigar room here, you just have to step outside to enjoy it.